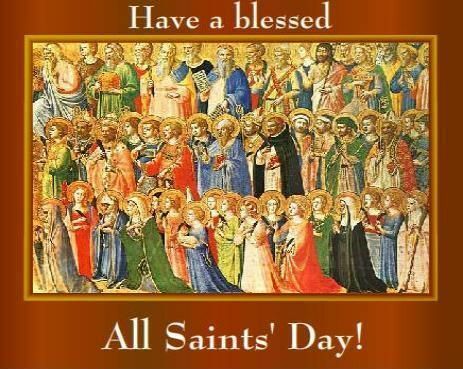 About All Saints’ Day: This feast is the most comprehensive of the days of commemoration, encompassing the entire scope of that great cloud of witnesses with which we are surrounded (Hebrews 12:1). It holds before the eyes of faith that great multitude which no man can number: all the saints of God in Christ—from every nation, race, culture, and language—who have come “out of the great tribulation … who have washed their robes and made them white in the blood of the Lamb” (Revelation 7:9, 14). As such, it sets before us the full height and depth and breadth and length of our dear Lord’s gracious salvation (Ephesians 3:17-19). It shares with Easter a celebration of the resurrection, since all those who have died with Christ Jesus have also been raised with Him (Romans 6:3-8). It shares with Pentecost a celebration of the ingathering of the entire Church catholic—in heaven and on earth, in all times and places—in the one Body of Christ, in the unity of the Spirit in the bond of peace. Just as we have all been called to the one hope that belongs to our call, “one Lord, one faith, one baptism, one God and Father of all, who is over all and through all and in all” (Ephesians 4:4-6). And the Feast of All Saints shares with the final Sundays of the Church Year an eschatological focus on the life everlasting and a confession that “the sufferings of this present time are not worth comparing with the glory that is to be revealed to us” (Romans 8:18). In all of these emphases, the purpose of this feast is to fix our eyes upon Jesus, the author and perfecter of our faith, that we might not grow weary or fainthearted (Hebrews 12:2-3). “Here’s the church, here’s the door, open the door and see all the people”. Some of you may remember the child’s rhyme about the Church above. In The Large Catechism, Dr. Luther explains that when we think of “church”, we usually think of the church building, as “we are going to church”, but he points out that the only reason a sanctuary is called a “church”, is “… for the single reason that the group of people assembles here.” The people who assemble are the Church, the communion or the community of saints, “the holy Christian Church” (Third Article of the Apostles Creed). The communion of saints is not the church’s making, but the Holy Spirit working in and through the Word of Christ faithfully taught and preached and prayed and sung and served in the lives of the Lord’s forgiven people. Yesterday, 500 years ago, Martin Luther posted the 95 Theses on the Castle Door Church. So today it was Day 1 of the Reformation and running? Yes, in a sense, but really no. Luther entered into the Church years before 1517 in and through the waters of Holy Baptism in the Name of the blessed and Holy Trinity. Holy Baptism is our re-formation as the Lord’s people and that had happened for Martin Luther on November 11, 1497, the day after he was born. November 11 is the Feast Day of St. Martin of Tours and so his Father and Mother named him Martin. The point is that the Lord in His Church was reforming sinners to be Christ’s own some time before October 31, 1517. The Lord had been building and reforming His Church since AD 33 when Christ Jesus rose from the dead and the Holy Spirit was poured upon His chosen people 50 days later. The Reformers of 1517 and following wanted the clear light of God’s grace alone to shine without the taint of works, that salvation is by God alone. We have been charged with preaching and teaching the Gospel since AD 33. When the doors of the Church are opened, we won’t see ALL the saints gathered because the myriads upon myriads are around the throne of the Lamb (see Revelation 5:11), awaiting with us the day of Resurrection and judgment. When we gather for Holy Communion, the pastor will pray, “…with angels and archangels, AND ALL THE COMPANY OF HEAVEN…”, even with 2 or 3 gathered together, there are countless more! The saints before us were built up by His Word of Law and Grace. We are called to keep the faith with the dead, who live in Christ waiting together the day of the general resurrection.